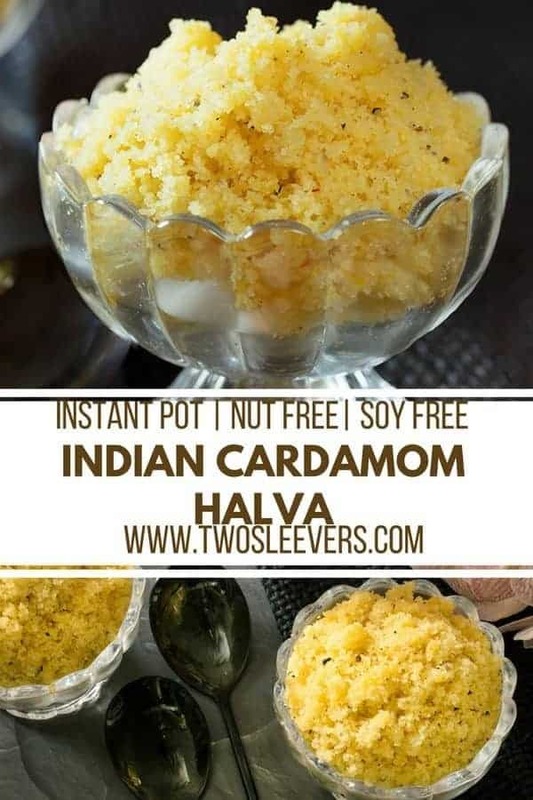 Here’s a simple Pressure Cooker or Instant Pot Halva recipe that will let you make this classic Indian Halva without having to stand, stir, control spatters, and wonder if it’s done yet or not. 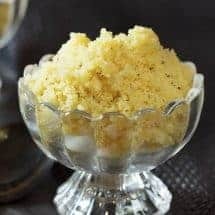 Whether you call it Halva, sheera, sheero, or kesari, you will agree this simple farina dessert is delicious and when made in a pressure cooker, quite easy. HOW DO YOU MAKE HALVA? Okay, it’s actually not that difficult to make stovetop halva–IF. IF you’ve ever watched it being made, IF you’ve had a family member show you how, IF you’ve eaten vast quantities of it in your life so you know how to tell when it’s done and of course IF you have time to stand and stir and control the adding of water so you don’t get splattered and burn yourself–which, a klutz like me has done many times. But if you’d rather be doing something else, or if you just don’t want to mess with watching it closely, this Instant Pot Halva Recipe will be your friend. Note that this is an Indian Halva recipe. Quite different from Turkish halva, or a Mediterranean Halva or a Levant version of it. This one is made with cream of wheat or farina. If you want to know the difference between farina and semolina, check out my post on the Eggless Farina Cake recipe here. HOW IS SOOJI HALVA MADE TRADITIONALLY? Traditionally, this recipe is made stovetop. First, you roast the sooji or farina. Then you add to it a sugar syrup you’ve prepared, along with lots of ghee and cardamom. Then you cover it and let it cook until done just so. We’re not making it that way. We’re not going to roast the sooji for starters. This is the part that takes forever. It does make a slight difference to the taste but really, it’s not a huge difference and I’m okay skipping it. We are also not making a sugar syrup and we are definitely not pouring the hot sugar syrup into hot sooji and watching it splatter all over our stove top and ourselves. WHERE DO I FIND FARINA? This is going to be a lot simpler than you think. Either go to the Indian Grocery store and look for sooji. Or go to any grocery store and get some Cream of wheat. Yup. Cream of wheat = Farina = Sooji. If you’re at an Indian grocer, look for Roasted Sooj. So I thought about this and decided to treat the sooji just as I would rice or any other grain. And I decided to make it Pot-in-pot so I could make a dry finished dish. If you’ve been struggling with getting perfect rice in your Instant Pot, I have a free download and a video that explains the best way to make perfect Instant pot rice. If you’re not sure about Pot-In-Pot Cooking, watch this PIP video and you will understand not only what it is, but when and why to use it. So in this Instant Pot Halva recipe, we are going to combine everything in the right proportions, cook it pot-in-pot, remove it and eat it. No really. It will be that simple. The other little hack I used for this was to grind saffron threads rather than soak them in milk, wait for them to soften, and dirty yet another dish to make it. 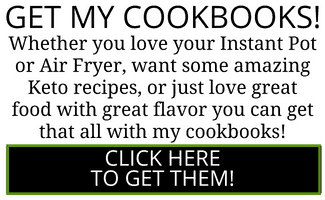 I use this same trick to make Persian Joojeh kababs. What you do is that you grind up some saffron with a little sugar in a mortar and pestle. Not only does this make the saffron easier to dissolve, it also stretches that expensive saffron a bit. So to recap, we are making this Instant Pot Halva by mixing up sooji, sugar, water, cardamom, and saffron. And then we are cooking it pot-in-pot for ease and to ensure the right consistency. Here's a simple Pressure Cooker or Instant Pot Halva recipe that will let you make this classic Indian Halva without having to stand, stir, control splatters, and wonder if it's done yet or not. 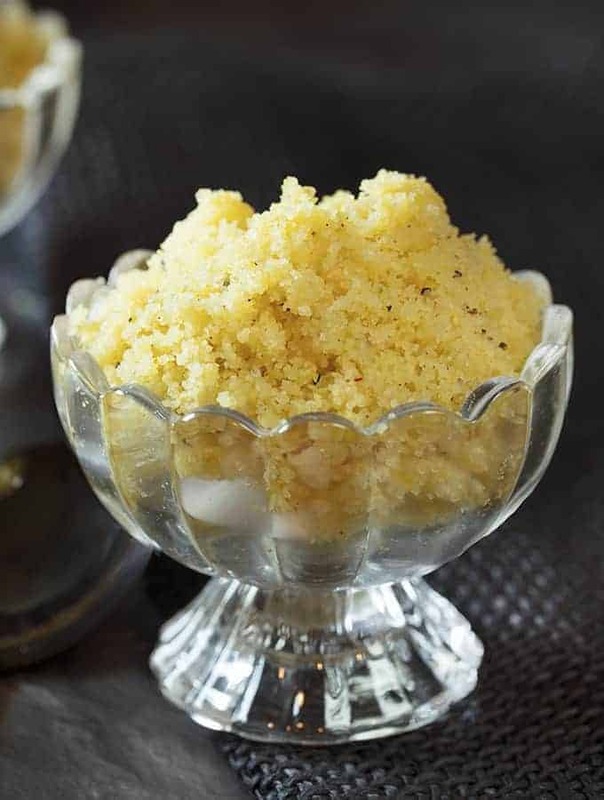 Whether you call it Halva, sheera, sheero, or kesari, you will agree this simple farina dessert is delicious and when made in a pressure cooker, quite easy. Grease a 6-inch x 4-inch pan and set aside. 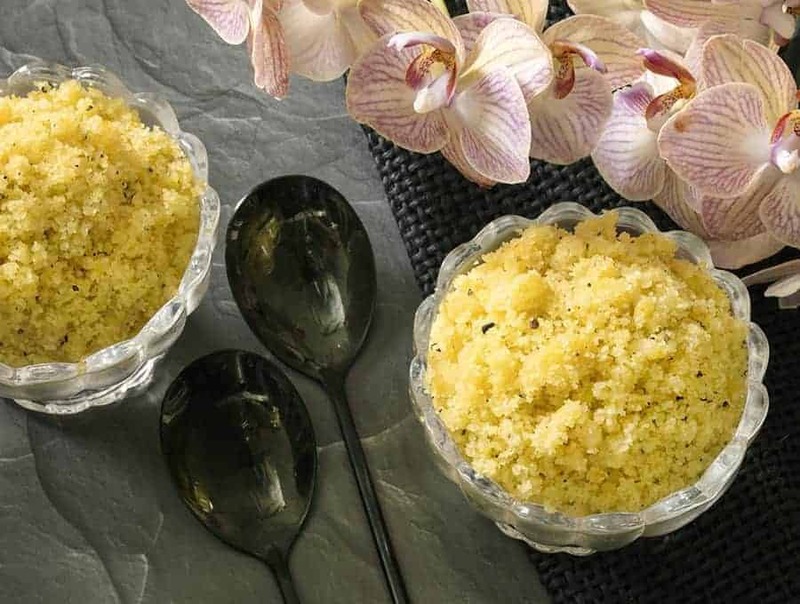 In a small bowl, mix together farina, sugar, cardamom and the saffron-sugar mixture. Add water and ghee and mix well. Pour the mixture into the greased pan and cover with a silicone lid or foil. Pour 1.5 cups of water in the inner liner of the Instant Pot. Place a high steamer rack on top of this. Place the cover pan on the rack. 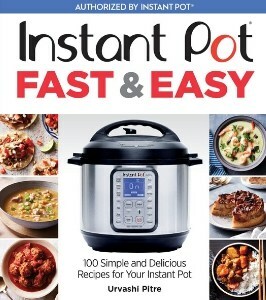 Set the Instant pot to cook on high pressure for 5 minutes. At the end of the cook time, let the pot sit undisturbed for 5 minutes and then release all remaining pressure. Using silicone mitts, remove the inner pot. Use a fork or spoon to fluff up the halva and stir it around really well. You’re doing this to spread the cardamom and saffron throughout the halva. As you stir, you will see the grains start to separate, and the halva takes on a yellow-orange tinge from the saffron. Once the halva has been broken up and the spices are mixed in, the halva is ready to serve. Note: You may want to add additional ghee at the end because, really, one can never have too much delicious ghee. But start here and see what you think first. Here's a homemade ghee recipe for you. This is sooooooooooooo much simpler to make in the IP than standing over the stove!!!!!!!! 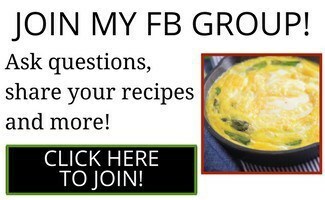 I’ve made this multiple times now, using Malt-o-Meal Farina Cream of Wheat. I think the malt is keeping it from becoming the golden color. The taste is fabulous. The cardamom is a lovely addition to the Greek version that I am used to eating. I am not sure I am tasting the saffron (or if I should be). I cut back on the butter by about a tablespoon because I thought it was too greasy and it never solidified the way I expected. I also reduced the sugar by making it under 1/4 cup. It just doesn’t need to be the full-1/4-cup-of-sugar sweet. 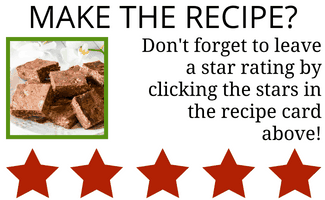 Another really interesting looking recipe. A few too many carbs for right now but looking forward to trying it in the near future!